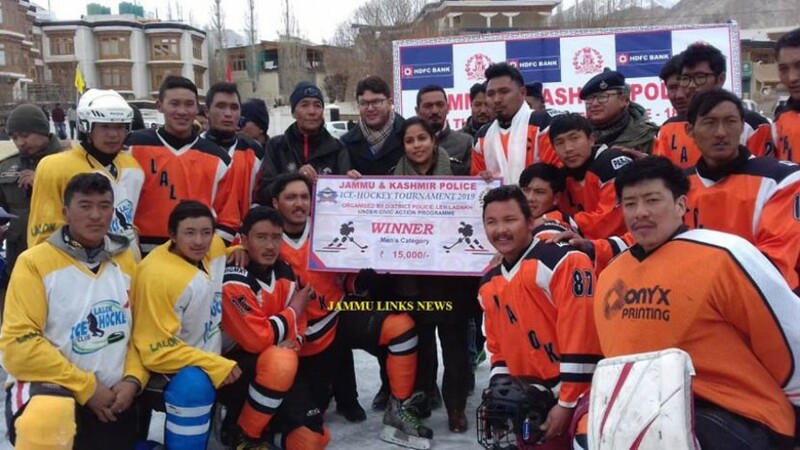 In the first J&K Police Ice Hockey Championship 2019, SECMOL team in women category and Lalok team in the men category won the championship. With an exhibition match between DHC and Lalok team, the tournament was concluded on February 6 at Ice Hockey rink Karzoo. The tournament was organised by District Police Leh supported by HDFC Bank Ltd. and Ladakh Winter Sports Club. Eight men and three women teams took part in the tournament. During the final match, Skara team failed to turn up thus making Lalok team lift the trophy. Councilors from Tangste and Chushul constituencies alleged that name of the team ‘Skara’ was changed to ‘DHC’ (Devil’s Hockey Club) to play the final match against team Lalok. The protest made Lalok and DHC team play an exhibition match and by 2-1 DHC won the match. In women finals, Secmol team won the match by 6 - 0 from Siachen Angels. Sargun Shukla, SSP, Leh said that the main aim of the tournament is to encourage youths towards winter sports. She expressed happiness to see so many young girls participating in the tournament making it more exciting and thrill. She congratulated the winning teams and also extended appreciation to all those who have taken part in the tournament. A cash prize of ₹15,000 each was presented to the winner teams and ₹10,000 to the runner-up teams of tournament besides mementos and trophies. Samiullah Lassu, Senior Manager HDFC Bank, Stanzin Losal, SP CID, Namgyal Angchuk Gyalpo, President, Ladakh Winter Sports Club, Tsering Tashi, Youth Services Sports Officer were also present on the occasion.